I am not an avid tennis fan, nor a frequent reader of autobiographies. 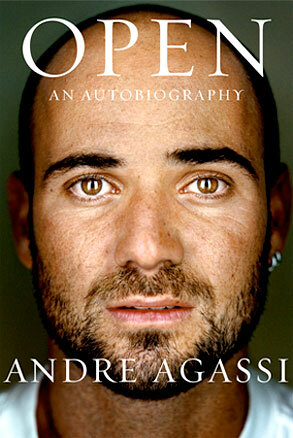 That being said, Andre Agassi’s Open is a book unlike any other that I have read — a book where I actually felt like I got a real life glimpse into a person I’ve never met outside of media coverage. Open chronicles Andre’s life from his childhood to the end of his playing career. We meet 7-old Andre, drilled unwillingly for hours a day on the backyard tennis court his violent father built for his training. We meet a rebellious adolescent, who dies his long hair, pierces his ears, and plays tennis in jean shorts. We meet both Brooke Shields and Steffi Graf, the women whose marriages to Andre shape much of his life. Ultimately, it is the revelations in this book that define it. We found out that Andre’s father used to tape a ping-pong paddle the his son’s hand while he was put to sleep in his crib, so that he could effectively play with the tennis ball mobile hanging above him. We learn that Andre has always hated tennis (really). We learn of Andre’s meth use, and we learn that while we thought he was running around with long, wild hair he was actually wearing a hairpiece. And of course there is the tennis. As Agassi puts it, “Always, tennis.” Andre’s memory recalls each of his matches in perfect clarity, his relationship with Pete Sampras given special treatment. 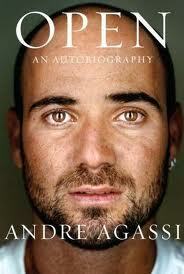 This book is special in its honesty — Agassi seems to be holding little back. He reveals himself as something of a lost child, a complete headcase with perhaps a twinge of severe OCD. But at the same time he reveals a person that is completely likeable, completely cheerable. And you get the sense that if his head had been on a little straighter, if he’d had a modern-day metal guru, his talent would have put him on par with the Sampras’ and Federers’ of the tennis world. If you’re a sports fan, you can’t help but enjoy this book.